​A year ago, Hurricane Harvey poured 40-plus inches of rain across Houston, paralyzing economic activity for nearly a week. The Federal Emergency Management Agency reported more than 161,000 homes damaged in the Houston Metropolitan Statistical Area. Of those, 24 percent were uninhabitable for at least 30 days. Despite the severity of this multibillion-dollar storm, Houston's housing market has rebounded completely and continues to expand. As discussed in the article “Imperfect Storm​," while flooding stretched across Houston, the destruction was unevenly distributed. Geographically, the northeast suffered disproportionately, followed by the region south of downtown. The most concentrated destruction occurred in two contiguous ZIP codes (77078 and 77028), where around 70 percent of homes incurred damages. Both regions (which comprise East Houston, Houston Gardens, and Settagast) contain stretches of Halls Bayou, which flows into Greens Bayou on the eastern edge of 77078. 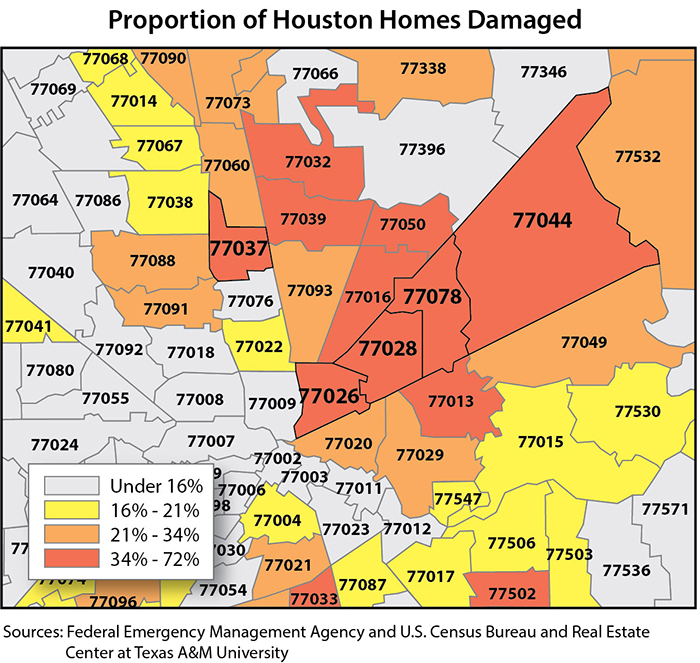 The next most damaged ZIP codes (77026 and 77044) were also in northeastern Houston or on Halls Bayou (77037), where about half of the housing stock was damaged. After a year, how are home sales and prices doing in the five most damaged ZIP codes? The ZIP code (77044) with the highest number of sales and prices has registered increased sales and prices while the months of inventory remain low (see Figures 1, 2 and 3). The same is true for the 77037 ZIP code. In contrast, the sales and prices of the most damaged ZIP code (77078) are below Harvey levels, but that area has three months of inventory. 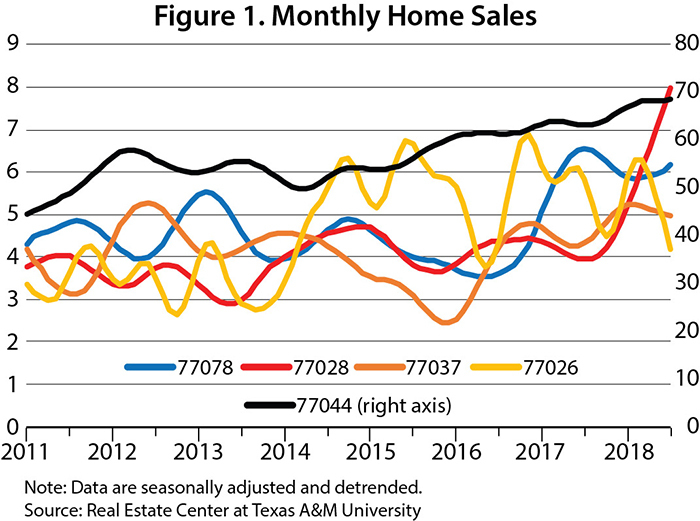 This sends mixed signals on how the market is doing, since sales are above and months of inventory are below their historical averages while prices have registered a steady decline since September 2017. This shows either some possible negative effects from Harvey or simply the particular characteristics of that housing market. The other two ZIP codes had mixed results. One of them, 77028, has positive sales but negative price growth after Harvey. 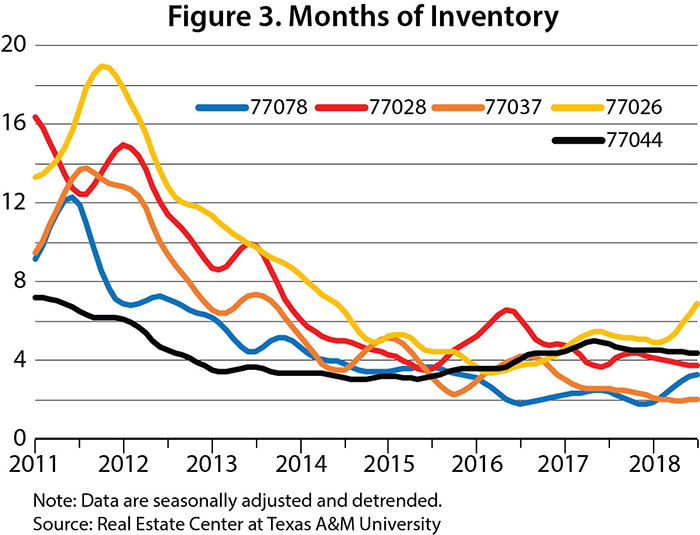 The other, 77026, has negative sales and positive price growth, but the months of inventory is rising, signaling that prices could start to decline, making it a market to watch. 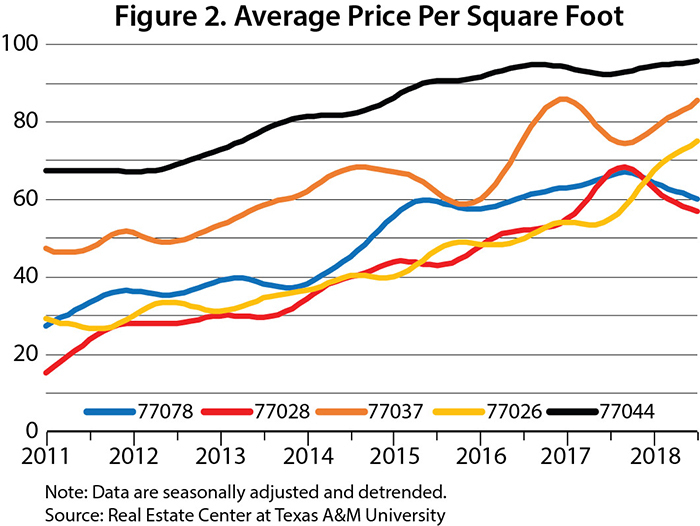 The problem with four of the most damaged ZIP codes is that market activity is volatile because of low activity, making it difficult to distinguish clear trends. But the general net effect is that the market seems to be somewhat better off than or basically the same as a year ago.